That blood vessels from different tissues are highly heterogeneous and interact differently with leukocytes during the inflammation response. 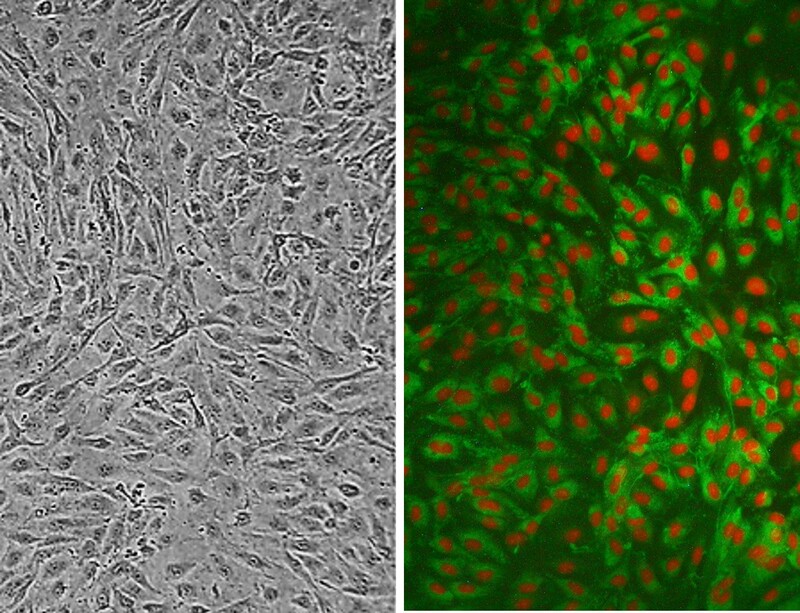 Human Carotid Artery Endothelial Cells: HCtAEC (L). HCtAEC immunolabeled for vWF (green) and nuclei visualized with PI (red) (R). Chami, B., N. Barrie, X. Cai, X. Wang, M. Paul, R. Morton-Chandra,m A. Sharland, J. Dennis, S. Freedman and P. Witting. 2015. Serum Amyloid A Receptor Blockade and Incorporation into High-Density Lipoprotein Modulates Its Pro-Inflammatory and Pro-Thrombotic Activities on Vascular Endothelial Cells. Int J Mol Sci 2015:11101-11124. Morrison, D., J. Aitken, M. deJonge, F. Issa, H. Harris, and L. Rendina. 2014. Synthesis and Biological Evaluation of a Class of Mitochondrially‐Targeted Gadolinium (III) Agents. Chemistry – A European Journal, 20:16602-16612. Cai, X., S.B. Freedman, and P.K. Witting. 2013. Serum amyloid A stimulates cultured endothelial cells to migrate and proliferate: inhibition by the multikinase inhibitor BIBF1120. Clinical and Experimental Pharmacology and Physiology. 40:662-670. Pluvinet, R., R. Olivar, J. Krupinski, I. Herrero-Fresneda, A. Luque, J. Torras, J.M. Cruzado, J.M. Grinyó, L. Sumoy, and J.M. Aran. 2008. CD40: an upstream master switch for endothelial cell activation uncovered by RNAi-coupled transcriptional profiling. Blood. 112:3624-3637.